A goal in each half by on-loan Pompey pair Brad Lethbridge and Dan Smith earned Bognor a brilliant 2-1 win at Merstham. 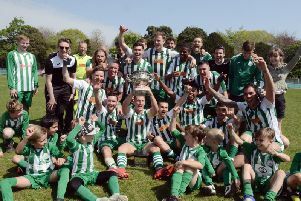 It continued a superb run of away form for Jack Pearce and Robbie Blake's team, who have also won at Corinthian Casuals, Burgess Hill and Whitehawk since the turn of the year. And it was just what was needed after the disappointment of Saturday's 3-2 home defeat to Tonbridge. Lethbridge put them ahead on 18 minutes but Gus Sow equalised eight minutes later. Smith got what proved the winner a couple of minutes into the second half to the delight of the travelling Green Army who'd made the midweek trip to the very wet Moatside ground. The hosts started brightly and were adept at keeping the ball for large periods. Richard Gilot's early pass through the middle towards Jimmy Muitt was cut out by a defender. Kershaney Samuels had a strike that went wide of the post after Smith failed to latch on to a clearance. Sow's forward ball found Roman Michael-Percil who pulled up with a hamstring problem but still managed to win a corner. Smith headed out Michael-Percil’s corner from the left. Ex-Rock Walter Figuiera ran on to a neat through-ball but Dan Lincoln denied him with a brave sliding interception. But the Rocks took the lead on 14 minutes against the run of play as Lethbridge smacked a shot low into the bottom corner. Michael-Percil’s corner was headed towards goal by Ollie Cook but Lincoln gathered. Harvey Whyte sped down the right before crossing and Smith diverted it just wide. The Moatsiders equalised when Bognor failed to clear the danger and the thorn in Bognor's side all evening, Figuiera, combined with Fabio Saraiva who found Sow in tons of space before he blasted his effort high into the net. Lethbridge received a ball from Gilot before cutting inside on the left and forcing a decent save from Amadou Tangara, who pushed it away. Fans appealed for handball as Chad Field defended a cross that flew on to his left arm. But the referee waved away the penalty claims. Whyte received a booking on 27 minutes as he complained to the referee about a decision. Samuels struck one at goal and Lincoln dived to his left to push it away on 35 minutes. Then Figueira received the ball from Sow before belting it low and wide. Tom Bird's cross found Figuiera who headed it well over the bar. Bognor had to deal with an array of quickfire chances just before half-time. Sow, Saraiva and Tom Kavanagh tried their luck - the last hitting a Bognor defender before going out of play. Bognor would have been relieved to go in at the break level. The Rocks started the second half well and on 47 minutes were in front again. Joe Tomlinson fed Smith, who turned into space on the edge of the box before composing himself and slotting home. Lincoln had to dash out of his area to beat Michael-Percil to the ball before a mix-up by Tangara and Simon Copper at the back almost allowed Doug Tuck and Smith in. A neat pass from Gilot saw Smith beat his man and he cut it back to Tomlinson, who smashed it narrowly over the bar. Merstham's Harry Osborne had to receive treatment and came off holding his hamstring. He was replaced by Michael Abnett. Lethbridge did well to run on to a diagonal ball before shooting and getting a deflection off a defender before the ball bounced just wide. Then Ed Sanders got in at the back post but headed wide in a cross from the left. Samuels went into the book for dissent after a late tackle on Gilot in the middle of the park. Lethbridge's shot was blocked when Smith inadvertently got in the way. Manny Ighorae hit one from long distance with some venom but Lincoln did enough. Muitt was replaced by Tommy Scutt on 89 minutes after taking a knock.Tackles were flying in and Bognor were entrenched in their own half as Merstham controlled the ball and when Sow hit another ball into the box with Samuels in pursuit, it forced another reaction save from Lincoln - but the linesman had his flag up for offside. Bognor held on to take the win, sparking joyous scenes at the end as the travelling Rocks support celebrated. They go fourth with this victory and next face AFC Hornchurch at Nyewood Lane on Saturday. Rocks: Lincoln, Sanders, Tomlinson, Tuck, Field, Reed, Whyte, Gilot, Smith, Muitt (Scutt 89), Lethbridge. Subs not used: Heath, McCormick, Osborne.